SCENARIO 1: The following transcript describes how a colleague uses the Ada service to help her transfer a student from one course to another. Helen: I would like to transfer a student. Ada: Good morning Helen. I'm glad to be of help. Ada: So, what's the students name and I.D number? Helen: The student's name is Timothy Holmes and his I.D number is 345679. Ada: Great. I see that Timothy is doing a Level 2 Business course. He just started a couple of weeks ago. Ada: Helen, I'm going to guess that Timothy wants to move to the Level 2 IT course? Helen: How did you know? Ada: Timothy has looked up the Level 2 IT course a few times on the course directory. He attended an appointment with Amy Penrose (Curriculum Leader for IT) last week and she made a note to say that she is happy to have Timothy join the course. He meets the entrance qualifications to join the course. Helen: I'm glad that you already have those details. Please transfer Timothy to the Level 2 IT course. Ada: OK - done. By the way, I placed Timothy into group 2 on the course. That'll mean that he can still do his GCSE Maths course on Thursday afternoon. Ada: I've sent a message to Timothy, his parents, Amy and his current tutor to confirm the transfer and he has been given a copy of his new timetable. Ada: Good news. Timothy has accepted the transfer. Ada: Is there anything else that I can help you with Helen? Ada: Don't forget. Your next appointment is in 15 minutes. It's in Room A3.23 at the Deane Road Campus with the ILT Team. SCENARIO 2: The following transcript describes how a student uses the Ada service to submit an assignment. The student is not directly logged into the learning management system. Charles: I want to hand in an assignment. Ada: Right. You have an assignment called Business Finance due in by 5pm on Wednesday 10 January 2018. Is this the one that you want to hand in tonight? Ada: I just want to let you know that you need to get a distinction grade on this work. Otherwise, there is a risk that you won't get the points that you need to get into university to do your Business course. Ada: You still have 2 days to check through your assignment. I noticed that you and your subject teacher Joe Riley are due to meet up for a one-to-one tutorial tomorrow morning at 10:00am in Room A2.03 at the Deane Road Campus. Ada: How about waiting to see Joe before handing in your work? It may improve your chances of getting a distinction grade and it will help you get your place at The University of Bolton. Charles: Ok - I will wait to see Joe. Ada: That's great Charles. Good decision. I will send a text message to you in the morning as a reminder. Ada: Is there anything else that I can help you with? Charles: When is the next open day for Bolton uni? Ada: The next open day for The University of Bolton is on Thursday 11 January 2018 (2 - 6pm). SCENARIO 3: The following transcript shows how a group of teachers in a team meeting use the Ada service to support their work. Alison: Let's review how all our students are doing. Ada, please rank the class by how well the students are doing. Ada displays the list of students to the team. Michael: I thought Jonathan was doing better than that. He's been ranked lower than I thought. Ada, why has Jonathan been ranked so low? Ada: Jonathan wants to go to university. He is doing well but he is falling short of the grade that he needs to get into university. He is currently averaging a merit grade. Jonathan needs to achieve a distinction grade to get into university. Alison: Ada, what does Jonathan need to do to raise his grade profile to get into university? Ada: Jonathan has four more units to complete before the course ends. He needs to get 2 distinction grades and 2 merit grades to average an overall distinction grade. Michael: With a bit of help I think Jonathan should be able to achieve those grades. Right guys, let's see how we can support Jonathan? The team meeting continues. SCENARIO 1: A member of the support team wishes to transfer a student from one course to another. This scenario utilises data from the College's main student dataset, course listings, timetables, search history, notes from support meetings, calendars and the staff directory to inform the conversation; and it takes advantage of various communication channels to distribute information to all the parties who are involved in the transfer of the student from one course to another. In this scenario, the Ada service starts to behave as a true cognitive assistant providing colleagues with a natural and intuitive user experience; offering a broad set of insights which would have been difficult to pool together on a traditional interface. SCENARIO 2: A student would like to hand in an assignment. This scenario demonstrates the potential value of using cognitive services in an education setting. In this instance the student is reminded about the grade that he requires if he is to pursue an undergraduate course at his chosen university. Ada can also notify the student about the grade that needs to be achieved prior to the assignment deadline date. This is made possible by using natural language generation (NLG) services. The ILT Team at Bolton College uses NLG across various services to support students across the campus. The Ada service enables the student to make an informed choice about delaying the assignment submission until after he sees his subject tutor. Here, the individual agents that make up the Ada service include those that are tasked with raising the grade profile for students and an agent that is tasked with supporting students to progress onto further and higher education. When these micro services are combined they enable students to make better decisions regarding their studies. SCENARIO 3: Teachers monitor student progress at a team meeting. This scenario demonstrates the power of cognitive services to simplify the process of gathering data and harvesting insights from that data. In this instance Ada behaves as a virtual member of the course team. The service enables teachers to deliver support that is targeted and informed. The topology that underpins the services that are accessed by students, teachers and by support teams may appear to be complex; but this is of no concern to those individuals. Their only desire is to make informed decisions and to carry out the tasks associated with those decisions without friction. The Ada service acts as an information bridge between the individual and the services that he or she wishes to engage with. 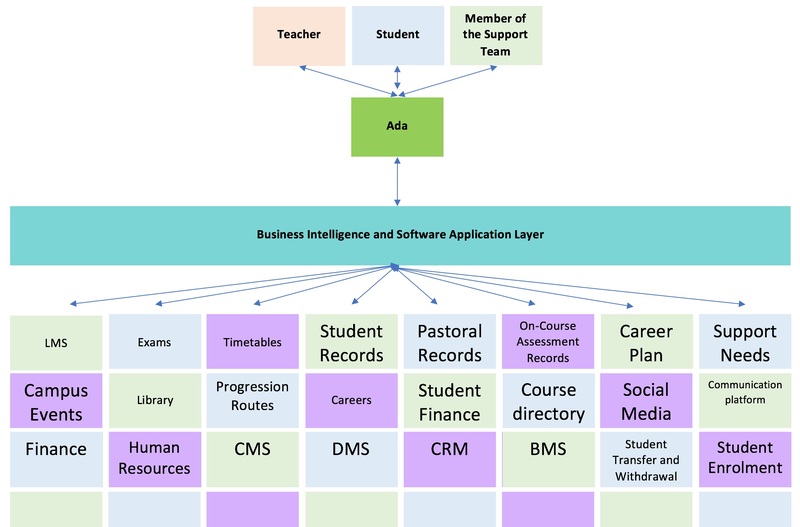 This enables the ILT Team at Bolton College to build and present multiple micro services around Ada that simply and ease day-to-day activities and tasks that need to be undertaken in a typical school, college or university setting; such as submitting an assignment, transferring a student from one course to another or checking student progress on a course; and many more. Since its launch in 2017, Bolton College's ask Ada service has expanded into a number of domains. For instance, a student can ask Ada hundreds of general questions about the College and life on the campus; or she can ask Ada about her exams schedule. As the service develops; particularly around the student-life-cycle, we hope that it will become indispensable for students, teachers and support teams alike. vendors that offer learning management systems, student information management systems or library management systems will soon offer digital assistants or chatbots as plugins - students and colleagues may be presented with multiple chatbots; do you want these chatbots to cooperate with each other or do you want to establish a single general purpose cognitive assistant for your campus? ensure that your chatbot complies with the General Data Protection Regulation (GDPR).